The first and only portable read, write and distance video magnifiers with OCR...and iPad Connectivity! 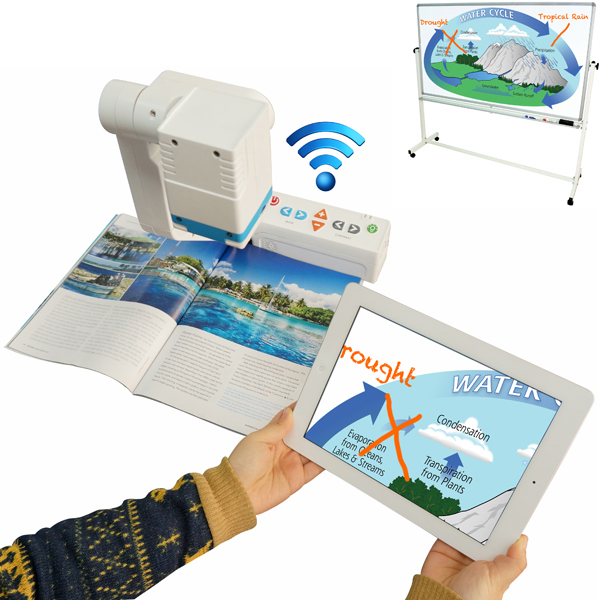 Connect E Bot to your iPad or Android tablet, PC or Mac to view and interact with your reading, writing or distance image. Use E-bot to read a book, see the blackboard or take notes in class. Use E-bot ADV to OCR capture the image on the screen, then listen to it read aloud through built-in speakers or headset (speaker jack available for earphone or headset). Display E-bot on your Windows PC or MacBook laptop. Set up is quick and the USB connection is easy, so moving from classroom to classroom or between the office and conference room is hassle-free. Use the built-in OCR to capture and read documents even without a PC or tablet attached, and listen to text read aloud using E-bot's built-in speaker.